On May 7, 1945, Nazi forces had all but disintegrated. Adolf Hitler had committed suicide and Soviet forces had already taken Berlin, resulting in the surrender of 70,000 Nazi soldiers. The failure of Nazi troops to stop this advance resulted in them signing a treaty of unconditional surrender. The declaration of surrender stipulated that Nazi Germany recognizes the authority of the Soviet Union and the Allied forces. Nazi forces also had to immediately cease hostilities and attacks and remain in their bases. 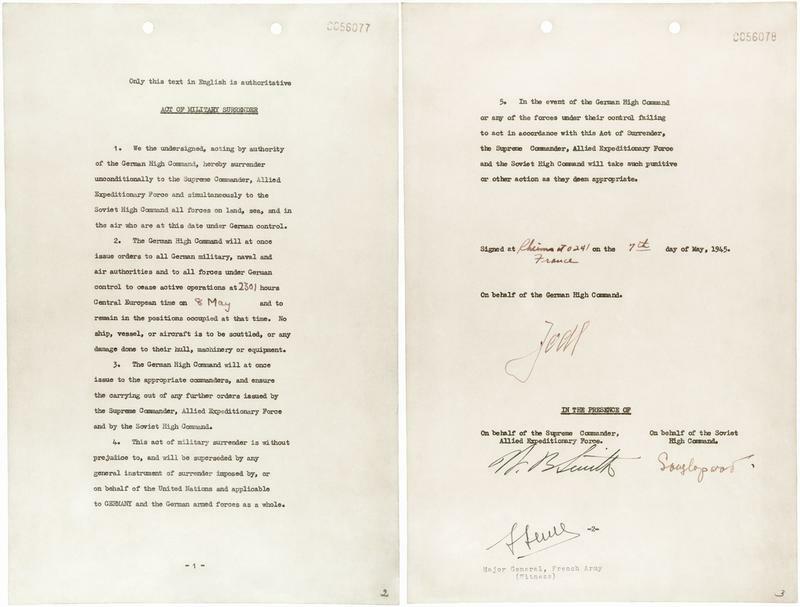 The signed Act of Surrender went into effect on May 8, 1945. Immediately after the surrender, Gen. Dwight D. Eisenhower, the supreme Allied commander, sent out a top-secret cable announcing the unconditional surrender of Nazi Germany and the victory of the Allies. General Eisenhower was sitting in his office awaiting the outcome of the surrender negotiations. Past the desk of his secretary and into the office came the Nazis, erect and cold. Eisenhower stood up. Rigid, and fixing a cold eye on his enemies, he demanded, "Do you understand all the provisions of the document you have just signed?" "You will, officially and personally, be held responsible if the terms of this surrender are violated, including its provision for German commanders to appear in Berlin at the moment set by the Russian High Command, to accomplish formal surrender to that government. That is all." The Nazis saluted and left, and Eisenhower relaxed. 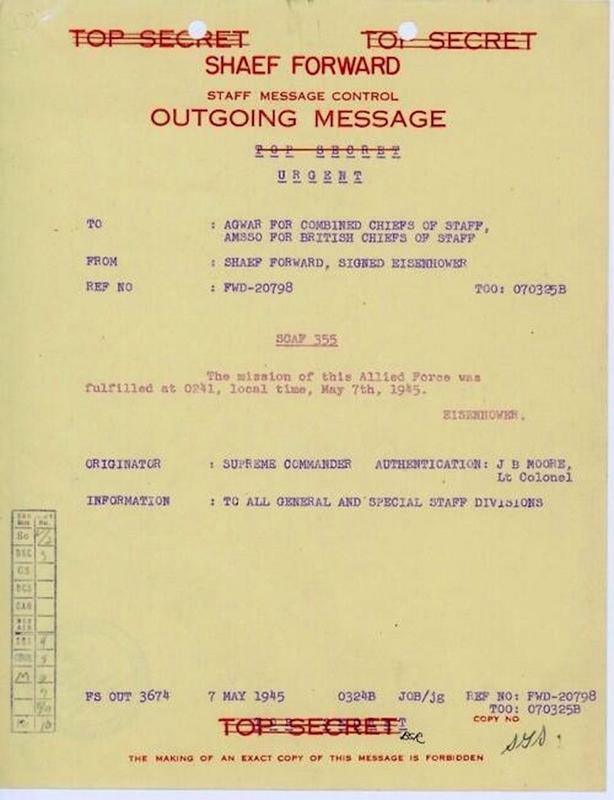 A few minutes later he sent a message to the Combined Chiefs of Staff: "The mission of this Allied Force was fulfilled at 0241, local time, May 7th, 1945."